[NEW] NOW is launching a series of interviews with leading women and men in Radiocommunications to give insights, to tell their stories and to show why more women should join this exciting field. 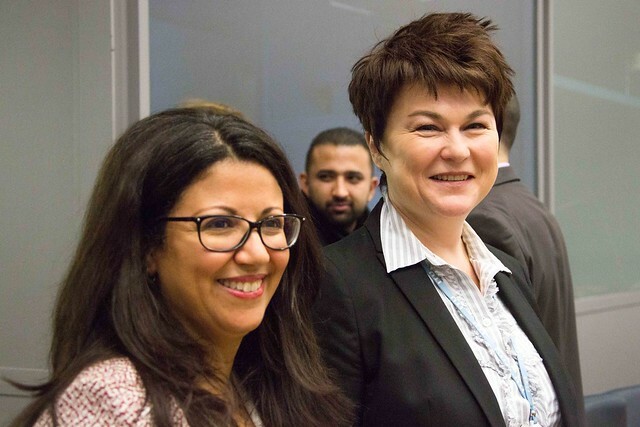 Tuesday – February 20 – Launch of new cycle of the mentorship programme of Network of Women for WRC-19 (NOW4WRC19) open to participants of the ITU-R Working Party 4A meeting at Geneva. Friday – February 23 - Introductory Session of Network of Women for WRC-19, a side event of ITU-R Working Party 4A meeting (13:00 – 14:00 in Room G1, ITU Varembé Building, 3th floor). The third mentorship programme cycle starts at the Working Party 4A meeting in February 2018 to be held at ITU in Geneva. In this cycle the focus will be on the technical topics and processes of Working Party 4A in relation to the WRC-19. If you simply want to follow this initiative, you may fill in the contact form HERE. The Network of Women for WRC-19 initiative was launched last December (2016) by the Director of the Radiocommunication Bureau, Mr François Rancy. For further information, please visit the related website. The Network of Women for WRC-19 initiative will cover main ITU-R events from now until WRC-19. The NOW4WRC19 initiative builds on the success of the WeLead mentoring programme launched by FCC at the WRC-15. It benefits from the experience of 15 years of growing synergy between the community of women delegates in the radiocommunications sector, from the Annual Women’s Breakfast​, to the Women's Leadership Workshop at WRC-15. ​NOW4WRC19 aims to continue growing the synergy of this community and providing a forum for sharing knowledge, networking and mentoring. The first mentorship programme cycle started at the Working Party 4A meeting in May 2017 held at ITU in Geneva. The second cycle started at the Working Party 4A meeting in October 2017 held at ITU in Geneva. In these cycles the focus was on the technical topics and processes of Working Party 4A in relation to the WRC-19. These cycles have ended. If you have participated and are interested in giving feedback on the mentorship programme, please fill in the online form: for mentors HERE., for mentees HERE. The Introductory Session of Network of Women for WRC-19 held on Monday 23th October at 13:00 – 14:00 in Room G1 (ITU Varembé Building 3th floor) as a side event of Working Party 4A. We were pleased to welcome in this session our guest Dr Amina Lemrini Elouahabi, President of the High Authority for Audio-visual Communication (HACA) of Morocco and Co-President of the "Gender and Media" working group within the framework of the African Communication Regulatory Authorities Network - ACRAN. The session will be moderated by Ms Betty Bonnardel-Azzarelli. Ms Elisabeth Neasmith, Director, Spectrum Management and Development at Telesat, Chairman of the ITU-R Sub-Working Group 4A2e. Ms Lilian Jeanty, is a current member of the Radio Regulations Board (RRB) and a candidate for re-election to the RRB at the Plenipotentiary Conference in Dubai 2018. To follow this initiative, for more information, or simply show interest, please fill in this form. Developing women's leadership skills at WRC-15.